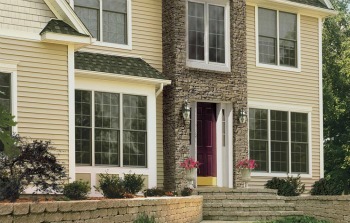 Smooth siding's look and finish date back to the 17th century. Harsh New England winters forced early settlers to replace customary mud and twig walls with solid wood siding, called "clapboards". They were laid in uniform three-inch exposure for weather-resistance and eye-pleasing appearance. They were then sanded, sealed and painted. 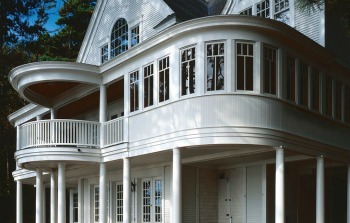 "Three inch to the weather" became the architectural tradition and an industry standard for the Colonies. Designed in the tradition of 17th century American craftsmanship. 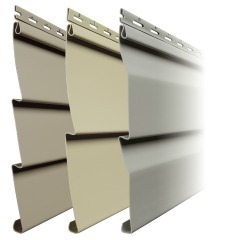 Historically accurate finish replicates smooth, sealed painted wood. Virtually maintenance free, never needs painting. Perfect for that fine historic home. Long lasting, low-maintenance benefits for years and years to come. Comes in a wide range of colors. 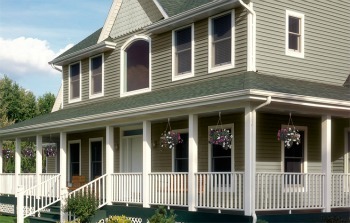 Smooth Siding with an Architectural History of Looking Good! Shown here used in conjunction with stone. Comes in a wide variety of popular colors.